With a change behind the camera and numerous additions to the original cast (because the majority of the players in the first died), Lionsgate/Summit continues with the marketing of one of the most highly anticipated films of 2013. Francis Lawrence (“I Am Legend”) helms the second installment of Suzanne Collins’ best selling young adult series, which stars newly-anointed Best Actress Oscar winner Jennifer Lawrence and franchise returnees Josh Hutcherson, Liam Hemsworth, Woody Harrelson, Lenny Kravitz, Stanley Tucci, Donald Sutherland, and Elizabeth Banks. Talk about a teaser of a teaser trailer! There was barely enough footage here to really get much of an impression of the second film of the series. We see Katniss, Peeta and Effie facing a door with their backs to the audience as they wait to be introduced to the District they are visiting on their Victory Tour. Of the 20 seconds in the teaser promo for the actual teaser trailer to be released later this month at the MTV Movie Awards on April 14, only six to seven seconds are actually dedicated to footage from the film. The rest is a promo for the awards show itself. It’s a shame, but what a way to keep the fans on their toes and wanting more. With the directorial change, the writing staff needed to be changed as well since Gary Ross wrote and directed “The Hunger Games.” Fans need not worry, however, because that duty was taken over by Oscar-winning writers Simon Beaufoy (“Slumdog Millionaire”) and Michael Arndt (“Little Miss Sunshine”). With writers like that, the script’s in good hands. Not only are the writers Oscar winners, but a good portion of the cast is comprised of Oscar winners or Oscar nominees. 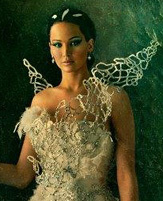 If you missed the Capitol Couture posters of the lead protagonists of the film as part of the marketing materials pushed out last month, along with Katniss and Peeta’s Victory Tour poster, check them out here at ItsJustMovies.com. Rumor has it, Liam Hemsworth will be revealing the first two and half minutes of the film, so check back after April 14 for the teaser trailer itself and let us know what you think. “The Hunger Games: Catching Fire” will propel into theaters on Nov. 22.